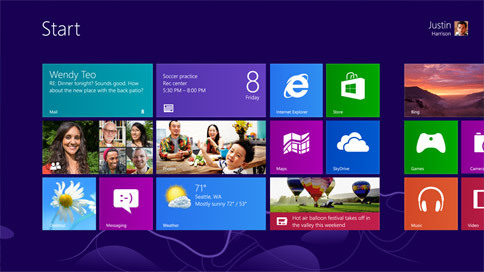 Today Microsoft reveal the “release preview” version of Windows 8 which mostly indicates that the new Windows operating system is feature-complete. Windows 8 Release Preview is available as a free download and it is very likely that your existing system specs are good enough to run Windows 8. Should you download Windows 8 Setup or the ISO Image? As you may have noticed on the Windows 8 download page, the installation of Windows 8 can be done in two ways. You can either take the easiest route and download the Windows 8 Setup program – that’s also the default option. Alternatively, you can download ISO Images of Windows 8. If you are planning to install Windows 8 on your existing computer, either on a different partition (dual-boot) or just want to upgrade from an older version of Windows to Windows 8, the default Setup program is a good choice. Please note that that your installed software programs will only be preserved if you are upgrading from Windows 7 to Windows 8. If your planning to install Windows 8 on top of Windows XP or Vista, only the files will be preserved but not the various software programs that you may have on the disk. Your computer has an x64 processor but is currently running the 32-bit version of Windows. If you want to install the 64-bit version of Windows 8, download the 64-bit ISO. You want to install Windows 8 on your Mac (iMac or Macbook) using Boot Camp software. You want to install Windows 8 on multiple computers. In that case, you can download the ISO once, create a bootable DVD and boot the other systems using this newly created Windows 8 disk. You are running Windows XP. The universal product key for Windows 8 is TK8TP-9JN6P-7X7WW-RFFTV-B7QPF. Will my software programs run inside Windows 8? Before grabbing the ISO image of Windows 8, quickly run this setup utility and it will show a list of all software programs and hardware drivers on your system that are compatible with Windows 8. Alternatively, you can visit this page to see a list of all known software and hardware devices that are found to be working with Windows 8. How should I go about installing Windows 8? You can have Windows 8 on your computer in three ways – you can install Windows 8 side-by-side (also known as dual-boot), as a virtual machine (so that it runs inside your existing Windows just like any other software) or you can have Windows 8 as your primary OS (there’s no going back from here). If you just want to try out Windows 8 but without modifying any of your existing set-up, the safest bet is to use a Virtual Machine. If you have a vacant disk partition or don’t mind creating one (it’s easy), go for the dual-boot option. Else, if you have a spare computer, you can consider upgrading to Windows 8 overwriting the previous installation of Windows. Also note that if you are upgrading from Windows 8 Consumer Preview to the new Windows 8 Release Preview, none of your installed programs, files and account settings will be preserved though everything would be moved to the windows.old folder.